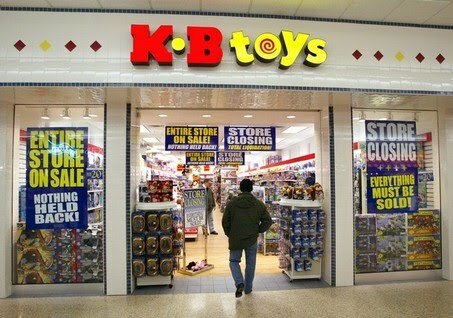 It’s remarkable how every KB Toys is always in the process of going out of business. 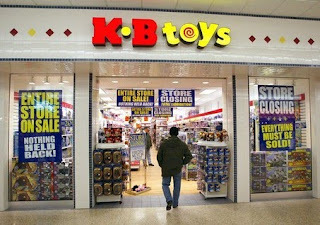 I saw a Sharper Image open and close in the time that a KB Toys continued to “go out of business.” Basically, things can’t be that bad if you’ve managed to go out of business for 12 years. I imagine their employee training manual contains things like, “Chapter One: No Eye Contact.” Or “Chapter Five: Make the Sales Floor Look Like a Refugee Camp.” All of their merchandise must come in a huge barrel that they just dump in the store. They may not have a lot of up-to-date toys. But they are the place to go if you’re looking for a Robin Hood: Prince of Thieves action figure or a Batman Forever clock radio. But you better hurry, because these great clearance prices are only going to last for a couple more decades. wow ,, i remember this happening in my town. I was walking the mall and noticed all their signs about going out of business.I had only $250 dollars that I can spend. It was the last day for the sale and when I was picking out all these star wars figures and gi joe figures really cheap they make an announce out loud. "Everyone in here this gentlemen just bought the entire store please stop shopping and make line to pay. I was like "WTF" BSSSSSSSSSSSSSSSSS lol I couldn't believe it. lucky motherf@cker.